O-Scale Crossing Gates (set of 2) 30-11012. Some run smooth. Some are noisy. Two sets of gates (purchased in 2000) have operated great on accessory power for years. One gate quit and the replacement set purchased had noisy gears. The second set of gates purchased sounded the same as original gates. 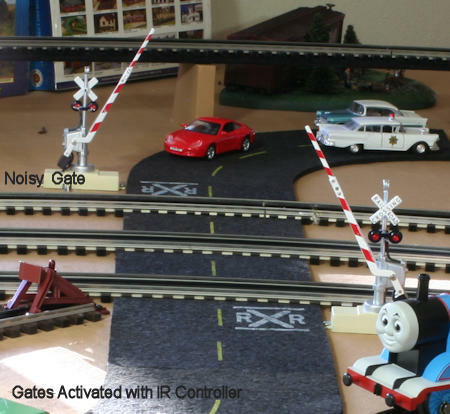 Two videos with sound have been posted here, O-Scale Crossing Gates . MTH says some are just noisy. I have gone through 2 sets of these MTH Rail King crossing gates. both sets eventual died and after the last set bit the dust I decided never again. I have a set of the MTH high way crossing flashers with bell sound, and this set of flashers has been working fine for 15 years. All 4 of mine are noisy. One gate quit last year, stuck in the up position. Anyone have a breakdown of the internal parts so I can see what's wrong? It's a major issue to remove it from the layout and check it on the bench as scenery - paint would have to be re-done. If there is a fix, I will pull it. SIRT, I attempted repair on mine but didn't go into the motor or gears because mine was running smooth. It started intermittent action then finally quit so I assumed electrical. It wasn't repairable because the circuit boards are too small for my repair expertise. Here are photos of the electrical guts. I repair cell phones - i phones every day so not a problem. Probably a worn or slipping gear as the electronics respond with a passing train. Gate just wont go down and cant be forced down either. As you can see, the sidewalk and scenery area will have to be compromised. Maybe some day I'll get to it? LOL! Yes, these are prone to cardiac arrest. But, I've become quite successful in resuscitating them....thanks to Dave at NWSL (NorthWest ShortLine). 1) Most frequent cause of malfunction is the small plastic gear on the end of the motor shaft. The production version is plastic....destined to eventual failure: the gear splits and becomes loose on the motor shaft. No problem...if you're willing to spend about $10 for a new METAL gear, ream/drill the I.D. thereof for a proper light press fit...or, less desirably, VERY close slip fit with a drop of CA to secure...and properly support the motor shaft when the gear is pressed on. The NWSL correct part is 37410-6, a 10-tooth spur with a 1.5mm bore...the latter requiring sizing up to the motor shaft diameter. Oh yes, be sure to note the correct position of the gear on the motor shaft....the new gear should be essentially flush with the end of the shaft. 2) Noisy gears are most often associated with the failed/failing motor gear and its mesh with the larger ring face gear. In some cases I was able to create the grinding noise AFTER I replaced the motor gear simply because I had not been careful in re-positioning/assembling the motor back into its cradle in the base housing....a correctable embarrassment! I obtained a quantity of DOA crossing gates from a chap, and found a few noisy gears.....the result of very evident tampering (opening up, poking about) with the motor mounting. 3) The third cause of cardiac arrest is too much tampering and over-adjusting of the limit contacts in the housing in which the crossing gate rotates. In fact, my personal experience with these gates on my layout is that, if the gates start to act up, DO NOT rush to play with the limit screws on the gate housing!! FIRST, check the gear on the motor shaft. Actually, I've found the factory setting of the motion/lights limit screws to be quite accurate and needing no further adjustment. In any case, rotating one of the limit screws more than a couple degrees is asking for trouble, more than solving a problem! One reason for NOT getting quickly into the crossing gate housing is that the arrangement of gears/cams is VERY fussy, having unique orientation and positioning. I tend to consider a problem traceable to this housing and its complicated internals as the final death knell....not worth the trouble/aggravation to fix. 4) BUT!! !....even if you give the crossing gates their last rites, you can usually salvage the flashing lights. It's not too difficult to disassemble, excise the specific parts that relate to the gates and their motion, saving the lights and circuitry. The gaping long hole in the middle of the shaft can be closed up with some plastic tubing cut to fit and painted silver to match the rest of the assembly. Voila! Flashing lights....with out gates! Need sound? Look up ITT Products and other sound chip/circuit providers for a crossing bell sound, add speaker......voila, voila! Lemonade from lemons!! OK.......so that's what I've learned...in part. Why MTH hasn't stepped up to a metal gear on the motor shaft is probably an issue of cost. But I personally think it would be a customer satisfaction improvement in the longer run! Outstanding report DK. If I obtain some spare gears, I will pull the defective unit. KD, thank you for the info. What are the failure symptoms for gears? My gate that quit would go up from the down position. When it got to up position, it would not activate. It was one of the smooth running gates. Well, I see nobody has closed this thread, so I'll just add on almost 2 years later!!! I bought a pair of the 30-11012 crossing gates at a train show and once again the guy swore they worked - but they didn't. One went up and down but VERY slowly, like it would have taken 5 or 6 minutes to go either way. The other gate went down and then sat there … grinding the gears! I found the problem with the slow gate was up in the gear box - the gear box housing simply needed to be loosened and tweaked - something was binding. That one now works perfect, but is a wee bit noisy. The other one had a limit switch out of adjustment and was trying to shove the gate into the ground. Also the gate was bent, although I'm not sure if that was a factor - I did straighten the gate and adjusted the limit switch and it now works nicely and is very quiet. Almost perfect except for one thing. In the raised position, when the lights should be off, they are barely flashing - you can just barely see them. If I squeeze the gearbox (gently) they will either get brighter and go into a normal flash mode, or they will go out - it's quite sensitive. So I'm sure the remining problem is an electrical contact problem with the limit switches. The problem is I don't know electrically what is supposed to turn the lights off. I think it's when the upper limit switch is activated, or open I presume. I guess when I have renewed energy and enthusiasm in the morning I'll pull the cover off the gearbox (been avoiding that til now) and clean things out - sounds like an intermittent connection issue, so some very judicious contact cleaning may be in order. My gate was barely flashing in the up position and would not stop. I fixed it by tweeking the upper left adjustment screw. Thank you, Steve. I found the same thing, only every time I tweaked the upper left screw, it lasted for just one or two down-up cycles, then it was back to barely flashing. I did remove the gear box cover, and cleaned both limit switches with alcohol-soaked tiny strips of cardboard, but it still was not right. So I pulled the (limit switch) cover off again, and got more aggressive with #400 sandpaper, followed by an alcohol soaked piece of paper towel for cleanup - that did the trick, works like a charm now! I finally wired both crossings up to my 45-1028 ITAD (also bought at a train show) and all is well in crossing-land!!! George Thanks for your reply !! I think little fingers were at the center of my crossing gate issues. I had one gate that wouldn't raised and the motor continued to run. The flashing lights wouldn't turn off when raised on the other gate. I saved a some bucks on the bay on replacements advertised as old but never used and working. I installed one to replace my stuck down gate, the replacement gate worked but slightly slow and noisy. It also went too far down and the flashing lights didn't turn off. Fiddling with the adjustment screws fixed the too far down and lights issues. My other gate lights were also fixed with tweeking the upper left adjustment screw. At some point, I have to try and return my stuck down gate to service. I can testify that those crossing gate mechanisms are indeed quite delicate, and definitely not something likely to survive a carpet layout with little fingers around! I was surprised at the good fit of all the parts, obviously well engineered and manufactured … with perhaps the exception of the tiny plastic gear on the motor shaft. Although my motor gears were both good, it's obvious that there's not much plastic there to keep those tiny gears from splitting. Well, the car has been mostly cleared of snow and the interior is warming as I get ready to head out for a train show in Salem, OH this morning. Hopefully I will find a couple more that I can purchase with renewed confidence that they CAN be repaired - just hope I don't have to go the metal motor gear route - that sounds a bit iffy and def adds to the cost. Happy Sunday! I believe you may have discovered the problem on your own. I have had to go in and simply super glue a couple of the slipping gears back in place. Once I have done that they haven't come out again. If you hear your gate making noise, all may not be lost. Let us know if that works. 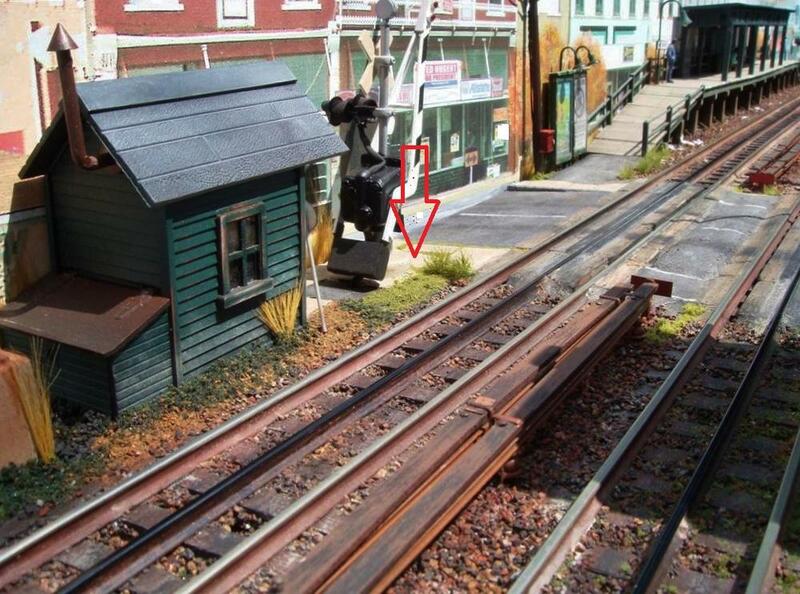 Why can't MTH or Lionel make scale crossing gates the same way Lionel made them originally, with a solenoid ? Those things are almost bullet proof. You can't damage them if you accidentally push them down. The solenoids almost always work unless someone has tampered with them. So why haven't we seen something like the originals in a scale size ? Actually, I saw an MTH crossing gate at the train show. It was packaged like mine, looked nice n' new, but it was physically huge compared to my two little (scale) guys. I asked the owner about it and he said it was MTH's foray into the "toy" world of Lionel, that they had built these to simulate Lionel's early stuff, complete with solenoid operation! I never have time to repair the two gates. Glanced at them last night. Looks like the watchman's in the way. I'll try to remove the cover vs. damaging the scenery on one and see. Might get lucky? My MTH gates are SCALE. Not sure about what the other people are seeing?